When it was time to have our cracked and dripping gutters repaired, I piped up with, “Hey, let’s set up a rain barrel!” I was thinking about those tomato seedlings I had just ordered: they were going to need water, and we didn’t even have a working outdoor faucet. 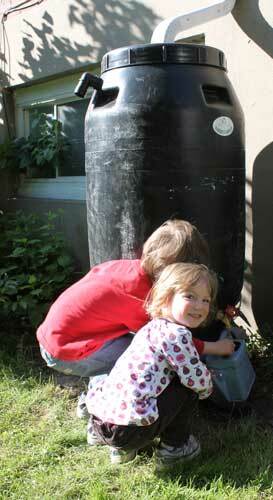 A rain barrel seemed like the perfect, enviro-friendly solution. “A rain barrel is an easy way to reduce tap water consumption,” says Janis Crawford, co-owner of Alter Eco, a local company that makes rain barrels from recycled materials. You can use rainwater to water your plants and lawn, clean your entranceway or fill a pool. Her company estimates that you can collect about 800 litres of rainwater per month from April to October, with just one barrel. Founded in 2001 by Jean-Martial Bonis, Alter Eco is “a Quebec business with a positive view of environmental change.” Crawford says interest in rain barrels has really grown in the last three to four years. Last year, they made 7,000 rain barrels. Many were sold to municipalities that have set up programs to promote rain barrel use. Not only are costs for producing drinking water astronomical, but Crawford points out that, with some cities experiencing tap water shortages or placing restrictions on water use, collecting rainwater is becoming a necessity. There’s a wide choice of rain barrels at home renovation and hardware stores, but I like Alter Eco’s Rain Saver because it is made here in Quebec from recycled, food-grade plastic. Her company adapts the cover, adding a double screen to keep out mosquitoes, insects and leaves. They install a tap at the bottom, for filling a watering can or attaching a hose, and an overflow valve at the top, so that you can direct excess water away from your house’s foundation. Alter Eco will deliver the rain barrel to your door, but you have to install it yourself. I’ll admit that in our case, my husband did all the dirty work: he levelled out the ground with a shovel and set up a base, composed of two concrete bricks topped by a square patio stone, which he had picked up at one of the major home renovation stores (“pick up” being the operative phrase, because those stones are very heavy). Now, we are all enjoying the benefits of our new rain barrel. Not just me, as I fill up my watering can to quench my garden’s thirst, but my children too: on hot days, watering the plants has become their favourite activity! According to Environment Canada, during the growing season water use can increase by as much as 50%. “While lawns require a lot of water, much of this water is wasted — lost due to over-watering and evaporation,” their website notes. For some interesting facts and useful suggestions, see Wise Water Use.